Best known for its introduction of French theory to American readers, Semiotext(e) has been one of America’s most influential independent presses since its inception more than three decades ago. Publishing works of theory, fiction, madness, economics, satire, sexuality, science fiction, activism and confession, Semiotext(e’)s highly curated list has famously melded high and low forms of cultural expression into a nuanced and polemical vision of the present. 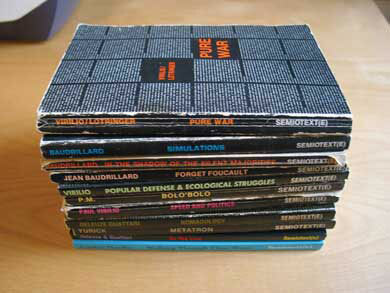 Semiotext(e) authors include Jean Baudrillard, William S. Burroughs, Paul Virilio, Catherine Breillat, The Invisible Committee, Eileen Myles, Mark von Schlegell, David Wojnarowicz, Abdellah Taïa, Guy Hocquenghem, Félix Guattari, Michelle Tea, Penny Arcade, The Bernadette Corporation, Pierre Clastres, Guy Debord, Michelle Bernstein, Dhoruba Bin Wahid, Christian Marazzi, and Peter Sloterdjik. An anthology, Hatred of Capitalism, was published in 2001 to mark Semiotext(e)’s move to The MIT Press as its distributor. Recent projects include the “Interventions” series, which began in 2009 with The Coming Insurrection, and “Animal Shelter,” a bi-annual journal. Semiotext(e) is coedited by Sylvère Lotringer, Chris Kraus, and Hedi El Kholti.